Most customers appreciated the strong build of the Asics Gel Venture 6, which made it great for trail running. The runners mentioned that the shoe remained very comfortable throughout their long runs. The users liked the fit of the Asics Gel Venture 6. Most individuals thought that the shoe runs true to size. The shoe offers a great level of support, according to a few users. Many runners admired the versatility of the shoe; they wear the shoe for biking, hiking, and walking. A runner appreciated the extra reinforcement on the shoe’s sides, as well as the supportive heel collar. A majority of testers were happy with the overall aesthetic look of the shoe. The individuals lauded the affordable price of Gel Venture 6. A couple of wearers noticed that the gel cushioning is too firm for their liking. A runner found these shoes to be a bit heavy for trail running. A few users noticed that the outsole is not as grippy as expected. The Asics Gel Venture 6 is a versatile running shoe with all the qualities a runner would expect in a pair of agreeable trail running shoes. Many users are satisfied with the shoe because it is comfortable, stylish, supportive and durable. Though there are a few flaws, overall, Venture 6 is a wise option for most individuals looking for an all-rounder in a reasonable price range. I’m a low-mileage runner and sometimes higher-mileage hiker living in San Diego, California. There are lots of interesting terrains to cover in San Diego, much of it rocky and sometimes unpaved. I learned from experience that light yet sturdy trail runner can often feel better than a heavier boot for day hiking. I decided to try the Asics Gel Venture 6 several years ago and have already worn out one pair after almost 18 months of use. I am now on my second pair. My criteria for buying this shoe were good traction, sturdy support, and a budget-friendly price tag. These shoes are advertised as being a general all-rounder with the capacity to take on rougher terrain. They are designed for a neutral gait, where the foot does not rotate too far inwards (over-pronation) or outwards (over-supination) during the gait cycle. There's a lot of science that goes into evaluating gait and selecting the appropriate type of shoe for the way you walk or run. That said, over time and through trial-and-error, you will be able to identify what works for your feet and what doesn’t. I have an average-width, medium arched foot. Due to chronic issues with plantar fasciitis pain over the years, I wear an over-the-counter orthotic device which was prescribed to me by my podiatrist. I find that for me, a neutral shoe combined with the orthotic inserts provides sufficient comfort for running and walking. Thus, the Asics Gel Venture 6 combined with the inserts provides just the right level of support for me. As a trail running shoe, the Asics Gel Venture 6 is built with a sturdy, lugged outsole. These lugs provide a solid grip on challenging terrain. The outsole also features a firm support bar across the midfoot which prevents the foot from twisting too much when walking on rocks and gravel. I find this support bar to be very helpful when climbing up and down rocky hills with loose rocks underfoot. The midsole of the Asics Gel Venture 6 contains the Gel cushioning system often found in Asics shoes. The Gel cushioning is located only in the heel of this style. The rest of the midsole is comprised of a dense, firm foam material. The midsole heel-to-toe drop is approximately 10 millimeters, which is a traditional drop for many running shoes and seems standard for Asics. The upper of this shoe is made of a tough nylon material which is designed to withstand debris. The toe is covered with a durable bumper for protection. Along the sides of the shoe, the brand’s logo (a striped pattern) is incorporated into the support system to create a kind of a “cage” around the midfoot. This holds the foot in place inside the shoe and prevents slippage. The heel of the shoe includes a pull tab which allows for easy on and off. The laces are rugged and will enable the wearer to secure the foot in the shoe solidly. My favorite thing about the Asics Gel Venture 6 is the level of support they provide. The midsole is made of a material that is firm yet also somewhat springy. It took me 18 months of rigorous use to wear down the material in my first pair. This solid support is essential on the trail and has allowed me to use these on ten-plus-mile hikes as well as neighborhood jogs and sessions on the leg machine at the gym. The support the Venture provides, in my opinion, is superior to that of some shoes that cost twice as much. I also very much appreciate the fit of these shoes. I am a standard size 9 medium, but often have to go up a size or a size-and-a-half to get a proper fit with many kinds of athletic shoes. I bought a 9, and it fits like a 9 should, with a solid midfoot lockdown and ample toe room. There is plenty of room to accommodate my orthotics as well as a medium-weight wool hiking sock. I have rarely found a better-fitting shoe. Next, I have found the shoe to be very durable overall. After 18 months of use, my first pair only had a few tears to the fabric inside the heel. The lugs on the bottom of the shoe were still fully intact (although somewhat worn down), and there were no tears to the uppers. I have rarely seen a shoe survive that long, especially at this price point. This leads me to my next point; these shoes are a bargain! You can find them for less than $50 easily. 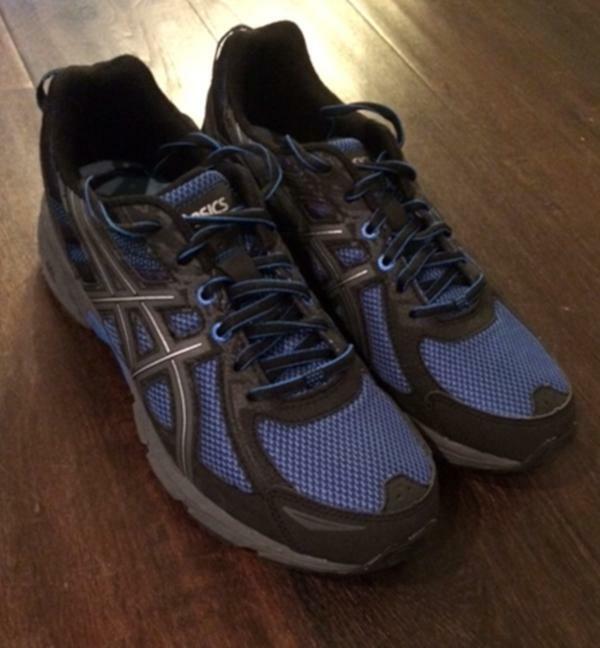 I spent less than $40 on each of my two pairs of Asics Gel Ventures. For a shoe that is as supportive and durable as these, that is an absolute steal. Having used the Asics Gel Venture, I can say that I will never spend more than $50 on day-hiking shoes for as long as ASICS makes this style. Despite all the positive aspects of the Asics Gel Venture 6, there are a few drawbacks to this shoe. First, Venture 6 does not include the extra lacing hole by the collar of the shoe which is standard on many Asics models. Why does this matter? Being able to lace the shoes up completely provides a more secure fit which is important when climbing up and down hills. The above picture shows where this hole is typically located on an Asics shoe (the other shoe pictured is the Asics Gel Excite 4). This matters to me because I have a low instep and a narrow midfoot. To get the kind of secure fit I like, I had to glue a cotton pad to the bottom of the shoe tongues (see picture below). This may not matter to some people, but if you have a lower instep as I do, you may want to consider this simple remedy. Second, the Asics Gel Venture does not breathe as well as some of the other shoes you can find for day hiking and trail running. The upper design sacrifices some breathability to create a tougher material. For me, this is not a big deal, because I find that my wool-blend hiking socks wick enough moisture from my feet to prevent discomfort. But if your feet tend to get hot, you may not want to use these for long hikes in the desert. Third, for those not inclined to replace the stock insole with something more supportive, you may find the shoes a little flat in the arch area. As with my lacing concern, this will certainly not be an issue for everyone. However, if you are experiencing plantar fasciitis or just like a little extra arch support during your jogs, walks, and hikes, you will likely want to remove the stock insoles and replace them with something more supportive. There are many options out there for replacing stock insoles, ranging in price from $10 all the way up to the hundreds. The Asics Gel Venture is a solid, supportive trail shoe which can be used for activities ranging from walks and jogs to strenuous day hikes. The shoes are durable and maintain their structural support very well after many miles of use. The price is reasonable, especially given all the great features they possess. While longer-distance runners and serious hikers may want to spend more for shoes that will meet their needs, the Asics Gel Venture will work for most people who want to explore the great outdoors without breaking their budget. The Asics Gel Venture 6 has been redesigned, from the upper to the outsole. The improved design and trail-specific outsole are meant to conquer rugged terrain with confidence. The mesh upper design has been enhanced for more breathability. It ensures the instant drying and cooling of the foot when subjected to the presence of sweat or unfavorable climatic conditions, thereby maintaining a dry and cool running environment for the user inside the shoe. While the midsole uses the same materials as the shoe’s earlier version, Asics has redesigned it to accommodate heightened cushioning and a better energy return. The ASICS High Abrasion Rubber (AHAR) is still present in the outsole of the Gel Venture 6, but the lugs were modified to survive uphill and downhill runs. The Asics Gel Venture 6 fits true to size. It is available in the standard widths of D and B for men and women, respectively. It welcomes those who have medium sized feet. The semi-curved shape of this shoe mimics the natural form of the human foot. The shoe houses technologies specific to trail running on its outsole for maximum traction both uphill and downhill on varied surfaces. One such feature is the inclusion of reversed lugs. These lugs improve the shoe’s performance by enhancing its grip on different surfaces. Their role becomes even prominent on sharp cuts, challenging slopes and wet ground. Same as in the popular Asics Gel Contend 4, the Asics Gel Venture 6’s outsole uses the AHAR® rubber for higher durability and enhanced flexibility. The outsole keeps the shoe running in a good condition for longer periods of time and ensures easy transitioning of the foot through the gait cycle without excessive wear and tear. The midsole of this Asics running shoes has the Rearfoot GEL® cushioning system for maximum shock absorption and a smoother heel-to-transition. While it provides a well-cushioned environment, it delivers a high-energy return, which keeps the wearer running without getting the usual amount of tired. The Asics Gel Venture 6 also comes with a high-quality removable foam insole for a customized feel of comfort for the users. The synthetic mesh material covers the upper section of the Asics Gel Venture 6. It is made from flexible and durable materials and it provides a desirable level of breathability for a well-ventilated running experience. The mesh material is sufficiently flexible for accommodating the natural bending of the foot during the running session. There is a breathable fabric lining across the shoe’s upper for additional air circulation and a healthy environment inside the shoe. The shoe also has a traditional lace-up closure with durable, semi-elastic laces. The lacing system is efficient enough in securing the foot while running. Lastly, the Asics Gel Venture 6 also features a plush tongue and collar. These give additional comfort to the foot while also enhancing overall fit. Performance. The Venture 6 is a reliable trail running shoe that offers responsive cushioning. The Gel Cushioning in both versions effectively absorbs shock during landing and releases high energy return for a more powerful toe-off. Both running shoes also perform well on varied trail surfaces. For both shoes, the outsole is durable and grippy. Comfort. Both versions of the Asics Gel Venture are comfortable. Thanks to the engineered mesh upper that offers proper ventilation throughout the run. The internal linings are smooth enough to prevent irritation and blisters from happening. Durability. The Gel Venture 6 is as durable as the 5th version. From the upper to the outsole, the shoe can withstand the harsh and damaging elements of the trail. The AHAR material gives additional durability to the outer sole. Fit. The overall fit of the Asics Gel Venture 5 is better than the Venture 6. Though the 6th version has a wider toe-box, the previous iteration fits snugly from the heel to the forefoot. Since the extra eyelets are no longer present in the Venture 6, locking the heel with the laces is not possible. The Asics Gel Venture 6 is designed to tackle the rugged terrain. It is packed with durable materials and trail-specific outsole for grip and a stable ride. But how does the shoe perform compared to the other trail running shoes? The Speedcross 4 is a reliable daily trail running shoe from Salomon. The shoe has satisfied a lot of users because of its performance even on wet, muddy, uneven terrains. It uses the notable Contagrip rubber in its outsole, which offers durability and traction. For cushion, the Salomon Speedcross 4 makes use of the molded EVA foam. This midsole foam delivers responsiveness and underfoot protection. For a more satisfying fit, the shoe utilizes the SensiFit system. The shoe offers a lot of foot protection as well. It keeps the foot dry and dirt free while running. Based on RunRepeat’s Corescore, the shoe belongs to the top list of well-rated shoes for trail running. Compared to the Asics Gel Venture 6, the Speedcross is more durable, and the grip is really impressive. It is not as lightweight as the Venture 6, but performance-wise, the Speedcross is better. Another well-rated trail shoe from Asics is the Gel Sonoma 3. Designed for daily running, the shoe feels heavy but very durable. It is as heavy and as affordable as the Gel Venture 6. The two shoes used the same AHAR material and Gel Cushioning. In terms of comfort and breathability, the Gel Sonoma 3 is more comfortable and breathable than the Asics Gel Venture 6. But, performance-wise, both shoes are very similar; they are supportive, stable and grippy. Compared to the Asics Gel Venture 6, the Merrell Trail Glove 4 has a more minimalistic profile. It has a zero drop with a very lightweight design. Built for competition, the shoe has a very responsive, durable cushioning made from EVA foam. In the outsole of the Merrell Trail Glove 4 is the Vibram TC5+ outsole. This material gives durability to high-wear areas and at the same time, it gives traction on varied surfaces. Attached into the outsole is Trail Protect Pad, which is designed for additional foot protection. Just like the Asics Gel Venture 6, the Trail Glove 4 is very affordable. It is a good option for trail runners who are looking for high-performing, durable, and affordable trail running shoe. Xero Shoes Prio is a lightweight, zero-drop running shoe designed for the trail. This model has become popular and admired by some trail runners because of its durable, comfortable, and low-profile design. Just like the Asics Gel Venture 6, the Xero Shoes Prio is meant for neutral runners. Performance-wise, the Xero Shoes Prio is better. It is also more durable, more lightweight and more stable. Price-wise, both are considered as cheap running shoes. If you are looking for a lightweight, affordable, and durable trail running shoe, then maybe you should consider the Prio. The Torrent is one of the best trail running shoes from Hoka One One. Impressively, the shoe is much lighter compared to the Gel Venture 6. It has an aggressive rubber outsole for durability and the prominent lugs offer multidirectional traction for varied terrain. The Hoka One One Torrent is slightly expensive but it is more durable than the Gel Venture 6. Review-wise, the shoe has received a lot of positive feedback. It is a good option for those who are looking for a durable and grippy trail running shoe.